The October Issue is LIVE! 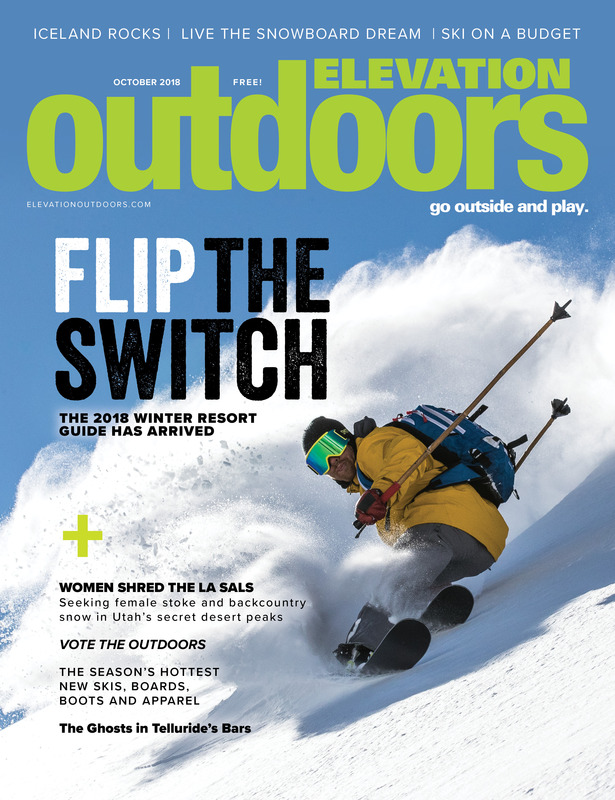 We here at Elevation Outdoors are ready for the snow to start flying, which is why we’ve devoted our October issue to all things winter! Get the stoke level up and start planning your winter adventures with tips for the top winter destinations and events, the best gear for hitting the resort, how to hit the slopes on budget this year, and ski like a local. Plus, dig into our 2018 Outdoor Voters Guide and get the scoop on the opening of the largest climbing gym in North America. It’s all in our October issue, on stands now! The recent Safe Outside survey of sexual harassment and assault in climbing shows that men are both vicitimizers and sometimes victims. It’s time we accepted that men need to be proactive in making a big change in the industry. Norway’s long spring days, corn snow and 63,000 craggy miles of mountainous coastline and fjords prove ideal for sail-to skiing. Wallet feeling thin this winter? These savvy bargains will get you out on the snow without breaking the billfold. If you plan on skiing out of town this winter, these tips can help take the tourist out of your mountain-town game. With as much to do off the slopes as on, Keystone demands a family visit this winter. This Gypsum, Colorado, runner wants to help prevent suicide. Check into these two climbing basecamp bargains from the American Alpine Club (ACC). With political tempers running high and decisions on energy and public lands in the balance, the state of Colorado is keyed up for a pivotal election this November. We give you information on the issues and the candidates across the state to help better navigate your ballot. You can line up for the big—and ever expanding—corporate skis resorts. Or head to these independently owned resorts that focus on keeping the soul in skiing and snowboarding. Teton Gravity Research (TGR) began with every ski bum’s dream: Make movies, travel the world, never give up your life living wild on the mountain. It has evolved to become the most influential multi-media action sports brands on the planet. Here’s the hard data on how Jackson’s Jones brothers and Co. shook the world. The AASI Snowboard National Team instructor and Warren Miller star is surfing the mountain dream and he wants to bring you along for the ride. Want to make it a winter to remember? Tick off these 25 must-do activities at our favorite winter resorts across the West. The new Earth Treks in Englewood, Colorado is North America’s Largest Climbing Gym. It’s huge—53,000 square feet and 50 foot-tall walls—but that’s just the beginning. Meet the outdoorsy pets our online readers loved best. Be sure to add these Rocky Mountain events and to your calendar to maximize the fun this winter. Add these perfect winter destinations to your travel list this season. The snow guns are blowing overtime at Loveland and A-basin and a new ski and snowboard season is almost upon us. Are you ready? We have picked out the gear that we plan on bringing up to the hill this winter to up our game and keep us cozy while we chase those powder dreams. When an all women’s group of 20 somethings seeks backcountry snow in an unlikely spot—the big mountain lines of Moab’s La Sals—they discover that sometimes being awesome just takes a little bit of encouragement (and a healthy dose of playful sarcasm). October is the season of scares and new snow. What better setting than the old bars of Silverton for a ghost story?